Darius Kinnel, a senior at St. Joseph’s Prepartory School, scored his 1000th point at a Jan. 12 match against Lansdale Catholic. Consider the first two weeks of Catholic League boys’ basketball. The following final scores reflect the tight window faced by players and coaches on a game-by-game basis. A jump shot here and foul shot there could literally provide the difference between preparing for the playoffs and watching from the stands. Consider . 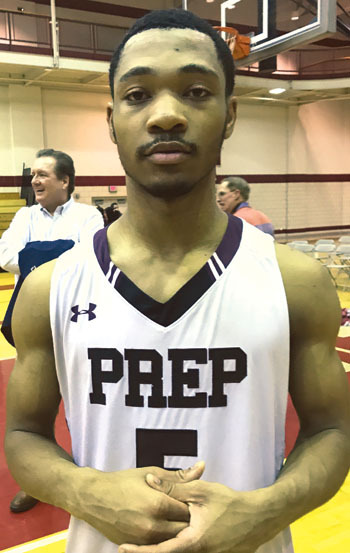 . . LaSalle 60, Conwell-Egan 58; Archbishop Ryan 78, Archbishop Wood 74; Cardinal O’Hara 70, Conwell-Egan 69; West Catholic 48, Father Judge 46; Archbishop Carroll 57, LaSalle 54; Neumann-Goretti 56, Roman Catholic 54; Bonner-Prendergast 63, St. Joseph’s Prep 61; Neumann-Goretti 67, Father Judge 59 in overtime; Archbishop Ryan 58, West Catholic 56; LaSalle 51, Cardinal O’Hara 48; St. Joseph’s Prep 59, Father Judge 54 in double overtime; Bishop McDevitt 56, Lansdale Catholic 55. Kinnel knows about pressure. Last Friday against visiting Lansdale Catholic, Kinnel needed six points to reach 1,000 for his career. However, the predominant reason for the standing-room-only crowd surrounded Prep coach Speedy Morris quest for 1000 career victories. On a driving layup with 1:51 left in the second quarter, Kinnel reached the quadruple-point plateau. Kinnel said “getting this on Speedy’s special day too was a wonderful moment for me” and added that Morris apologized to him for sharing the spotlight on Kinnel’s special day.